Space Safety » Archive » Space Debris » Kessler Syndrome » Batteries in Space: A Space Debris Disaster In The Making? Are batteries that are currently dormant in space a hidden danger? Will they bring the demise of man’s exploration outside of our atmosphere? From Sputnik to CubeSats, moon buggies to space shuttles, man has been dependent on batteries for space exploration since the beginning of the late 1950s. They are the heart of the spacecraft storing, regulating, and distributing the energy necessary to complete the mission at hand. Where do they get the energy while in space? Solar panels attached to the spacecraft consisting of photovoltaic cells (“photo” meaning light and “voltaic” meaning electricity) harness the sun’s energy to power the spacecraft during sunlight as well as charge its batteries. A constantly solar powered energy source would be the ideal scenario for a spacecraft but for the majority of missions, eclipses from the sun occur regularly, leading to the necessity for batteries to bridge the gap. Typical spacecraft in low Earth orbit (LEO) such as the International Space Station (ISS) and Earth observation satellites complete their orbits in as little as 90 minutes, resulting in at least 16 eclipses a day. Artist’s rendition of the satellites – whole and in part – currently orbiting our planet (Credits: ESA). 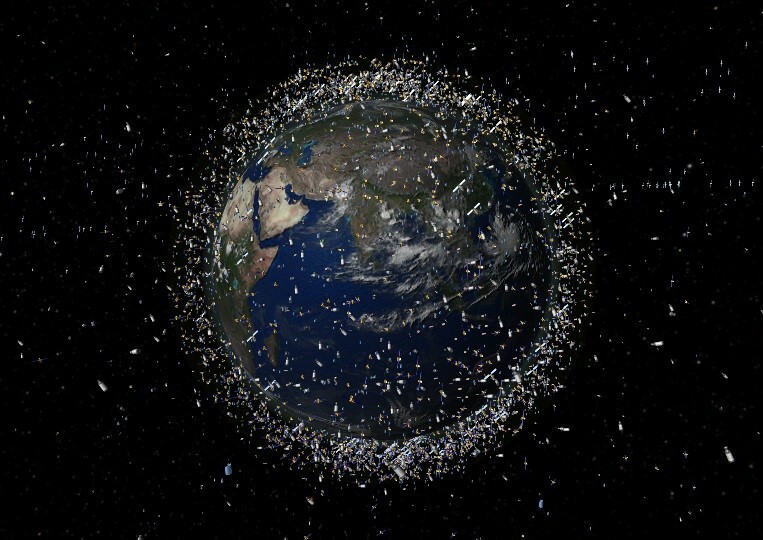 Humans have littered the space environment around us for nearly 60 years accumulating thousands of satellite objects, all with the potential of further breaking up and creating a hell above our heads to be feared by more than Sandra Bullock. Most spacecraft require batteries, meaning that most of the approximately 39,000 space catalogued objects launched in the 60 year period since Sputnik in 1957 have had batteries on board. With over a thousand satellites currently operational in orbit, the population of batteries in space is plentiful. The question then becomes: are they safe? The answer is no. A lifetime of charging, powering, and discharging as well as exposure to a harsh radiation environment has resulted in breakups and explosions in the past. The future for active and dormant batteries could lead to even more such explosions and breakups with supposed dead satellites becoming a serious threat. There has been a significant evolution of space batteries over the past decades, increasing their efficiency while decreasing their mass and size. Batteries are modified and customized to suit the conditions and requirements of the mission they are to be used for. In the beginning, a Silver-Zinc (Ag-Zn) battery was the battery of choice. It was the first battery to go into space on Sputnik 1 in 1957. It was the battery that carried the first living thing (Laika) into space, it was the battery that was used for the first interplanetary mission which was to Venus on Mariner 2 in 1962, it was the battery that landed on the moon with Neil Armstrong and it was the battery that got them there on the Saturn launch vehicles. The Silver-Zinc batteries used in the Apollo era generally lasted up to five years before they started leaking Mercury causing a serious health hazard and mission risk. They were therefore ideal for these short duration missions. For longer missions, something else was needed: that’s when Nickel-Cadmium (Ni-Cd) came in. NASA’s eight TIROS weather satellites were the first long duration missions into LEO and used Ni-Cd batteries, but they came at a cost of extra size and mass. NASA called on its commercial partners for more innovative solutions; Eagle Pitcher came through with the ‘super’ Ni-Cd batteries used on the Explorer series in the late 80s. The Cadmium in these Ni-Cd batteries is actually a toxic heavy metal which is a big health and environmental hazard. They are so dangerous that they are actually banned for consumer use in the European Union. Nevertheless, the space industry continues to use them because they offer a long lifetime and greater stability than newer Lithium-Ion batteries. Artist’s rendition of an exploding satellite (Credits: ESA). Nickel-Hydrogen (Ni-H2) then arrived on the scene, offering the capability of a longer and more efficient lifetime than the Ni-Cd battery. The Hubble Space Telescope, the ISS, and the Mars Global Surveyor were/are powered by Ni-H2 batteries. The replacement of Cadmium with Hydrogen relieves the worry from the presence of heavy toxic metals, but introduces a new risk: you now have a gas that when exposed to heat or a flame is a huge fire and explosion hazard. Why use it then? Because it offers nearly double the energy capacity of its predecessor. The final chapter, for now, on the space battery finishes with Lithium-Ion (Li-ion) batteries. This is the most common battery technology used today and most people in the western world carry one around in their pockets all day powering their smartphones. Li-ion batteries are currently being used to power the Mars Curiosity rover as well as the laptops on the ISS (those on Earth, too). They are the optimal choice of battery in terms of performance, but there is a reluctance to use them more broadly in space applications because they can easily become highly dangerous. NASA states that the main abuse conditions that these batteries experience – overcharge, internal and external shorts, high temperatures and structural issues – can lead to short circuits, corrosion, chemical exposure, breakage of numerous parts, fires, venting with flames, increased gas pressure, creation of toxic gases such as Carbon Monoxide and Carbon Dioxide. Most space organizations have come to learn that overcharged batteries can be problematic. The US experienced this firsthand with the NOAA-8 satellite in 1985. NOAA-8 was a one ton, 7.5 meter satellite whose mission was terminated early when its Ni-Cd battery overcharged resulting in the ultimate satellite death, an explosion. It is one of the circumstances that can be catastrophic to a mission as well as to our hopes of keeping space clean. Other examples of battery related incidents include the Cosmos-839 satellite which fragmented in 1976 due to battery malfunction and the geostationary Ekran-2 which in 1978 also exploded due to battery failure which in turn led to the complete fragmentation of the spacecraft creating numerous space debris objects. Explosion and fragmentation leads to more destruction and creation of more space debris in orbit. The consequential effect of satellite breakup is so drastic that according to NASA’s Orbital Debris Office, only 11 of more than 4500 space missions are responsible for 32% of all satellite objects currently in orbit. As of 2007, half of the orbital population is as a direct consequence of fragmentation and 12.5% is as a direct consequence of explosions. Where do batteries fit into the population? Although batteries make up a minor percentage of most spacecraft volume, they account for nearly 8% of all known debris currently in orbit. 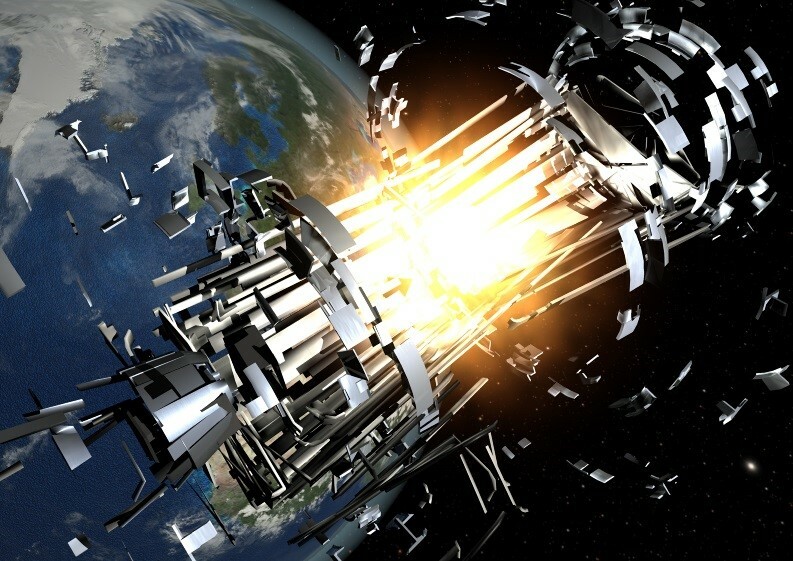 According to the US Space Surveillance Network (SSN), as of 2012, that is 8% of a population of size 17,000 debris objects. However frightening that figure, more frightening is the number of dormant satellites currently in orbit that are susceptible to incur more cataclysmic destruction. In the cosmic perspective, these dormant batteries have been in orbit for close to no time at all. Over the coming years, decades, and centuries they will experience bombardment from coronal mass ejections, solar flares, radiation, daily extreme temperature flux, and degradation of the thermal capacity of the satellite. 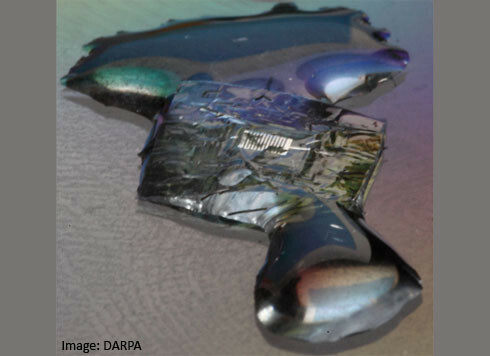 Decomposable microelectronics at SRI international in California paving the way for the future (Credits: DARPA). Given the demonstrated hazards presented by battery materials, care must be taken to avoid collisions following mission termination for fear of explosion. Therefore, specific measures were put in place by the Inter-Agency Space Debris Coordination Committee which aim to reduce the risks of such circumstances by suggesting that each battery on board a spacecraft must have a battery management system. At the end of the satellite’s lifetime, the battery management system puts the battery in a discharged state and short circuits it to prevent recharging, thus ensuring the satellite will not be lead into an overcharged state. The reasoning behind the support for this project is to prevent properties of the US Department of Defense getting into the wrong hands, but is there a more peaceful use for this game changing technology? Will the batteries in space in years to come simply disappear after the mission has ended? We can be hopeful that such bright times are ahead of us. If we continue on the same approach towards space debris and in particular batteries as we have in the previous decades, its destructive potential will be ignored until the inevitable happens. To be ignorant on this topic will potentially bring the end of space exploration. James is from Dublin, Ireland and is currently studying a Masters in Physics at the University College Dublin. He also holds an MSc in Space Studies form the International Space University and a BA in Mathematics from Trinity College Dublin. James is also currently involved with the 'Initiative for Interstellar Studies' and his interests are in the areas of deep space exploration, propulsion and CubeSats. His aims for the future are to increase Ireland's involvement in the space industry and to travel as much as possible. Not enough has been said about this in the past. most attention is on propellant tanks. great article, learnt a lot!